Sheex Reviews - Are These Bed Sheets Really Worth It? SHEEX performance is a bedding line designed to control temperature, increase air circulation, improve breathability, and keep your body cool and dry, all night long. Sheex Review: Are These Bed Sheets Really Worth It? SHEEX, who is advertised as the performance sleep start-up company, was created by two coaches from a University in South Carolina. We’re told that their bedding is unlike any traditional set of sheets – that they look like something you would wear on a trip to the gym or for a jog. These two coaches loved the feel of sportswear and decided to combine the same attributes of clothing that keeps you cool at the gym, and apply it to sheets that keep you cool while you sleep. To accomplish this, the company uses the same fabric that you would find in high-performance athletic wear – a blend of two materials, polyester (87%) and spandex (13%), that makes for a breathable, stretchy set of sheets. Aside from controlling temperature, if you're not a fan of having to iron your bedding, this line claims to be wrinkle-free, lightweight, and tight-fitting. SHEEX also covers a full range of temperature control products, from mattress toppers, comforters, and duvet covers, to pillows, sleepwear, and loungewear for both men and women. How Much Does SHEEX Original Collection Cost and Where Can You Buy? The original SHEEX performance sheet set is available to purchase directly off the company’s website, as well as Amazon, Bed Bath and Beyond, and Walmart. If you’re interested in purchasing a set, SHEEX is currently holding a special on their original performance collection. You can choose from four colors, bright white, ecru, navy, and graphite. Prices range from $159 - $219 for a twin, full, queen, king/Cal king, and split king complete set, along with an additional 25 percent off using a promo code. This offer is only available on the TrySHEEX.com promo site and includes free shipping, along with a one-year manufacturer warranty, and a full 30-day money back guarantee. One of the claims the company makes about their line of bedding is that their fabric is better than traditional cotton with nearly 50% more breathability. We’re told that they’ve been tested at Diversified Testing Laboratories and incorporate advanced heat and moisture transfer through evaporative cooling. From what we’ve been told on the FAQ on the company’s website, the concept of thread count does not apply due to their unique circular-knit microfiber used in the original collection. This is in stark contrast to traditional sheets, whose ability to exchange air (and thereby keep sleepers cool) is inversely impacted by a higher thread count. In addition to thread count, breathability and coolness are also about the material used. With several types to choose from in bedding, including microfiber, cotton, and polyester, we decided to do a bit of research on polyester vs. cotton, to understand the company’s claim of how their sheets breathe better than cotton. In an HGTV “Guide to Buying Sheets” article,” they mentioned that according to Jim Symmes, vice president at International, which manufactures sheets for Tommy Bahama and Laura Ashley, “cotton is by far the most-loved fabric for sheets.” Why? Because it’s “soft, durable, and breathes well,” Jim explains. Cotton has been around for a long time and continues to be a popular item in fabric-based products, with no show of a decline in demand anytime soon. It’s high-quality, easy to wash, doesn’t shrink easily, suitable for all skin types, and an excellent option for all year-round sheets. The downside is that it wrinkles. Polyester, on the other hand, has only been around for about half a century and is a petroleum-based synthetic fiber that has also grown in popularity for the manufacturing of clothing, carpeting, drapes, and other home furnishings. However, something to take into consideration is that according to the information we found in a Healthline report on polyester, it could potentially cause skin irritation and allergies for those who might be allergic to it, or who have sensitive skin. Comfort wise, both materials seem to have the sign of approval from sleep expert sites such as Sleepopolis and Sleepsherpa. Overall, we also didn’t find any evidence to suggest that polyester offers more breathability than cotton, however, nor to support the claim that synthetic moisture wicking fabric gives off a cooling effect in sheets. As far as the breathability claims made by SHEEX (i.e., that their sheets offer 50% more than traditional cotton), we didn’t encounter any proof of clinical testing on their website (or on third-party websites) to back them up. When on the market for a new set of bedding, focusing on factors like price, quality, and customer reviews is helpful. Here are a couple of brands to compare with that make similar claims to SHEEX on breathability and coolness. Brooklinen sheets also advertise that they offer a cool, breathable, sleep environment. The classic range will cost you about the same as SHEEX sheets. One of the main differences to SHEEX is that it is made from 100% cotton with a 270 thread count. We covered a review on this particular bedding line, and if you’d like to learn more about it, you can read our review here. 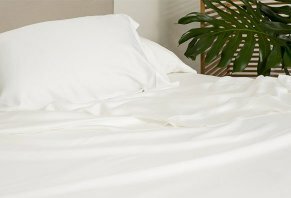 The $109 to $149 Percale range is recommended for hot sleepers as it is lightweight, breathable, and cool to the touch. It’s made from 100% breathable cotton and has a variety of patterns and colors. We’re not told what thread count this company uses, but what we do know is that percale uses a flat weave stitch, which is said to result in a cool, crisp fabric. According to their website, these no-thread-count viscose bamboo sheets are 83% more breathable than top-selling Egyptian cotton sheets, and are also ultra-stretchy and constructed without seams to enhance comfort. Pricing ranges between $99 and $129, and each set is available in four different colors. Available in nine different colors and priced between $200 and $210 for each complete set, Boll & Branch's solid hemmed, 300 thread-count sheets are made from pure organic cotton and are constructed from a single ply to retain softness and breathability. This brand offers the same moisture-wicking, high-performance material as SHEEX. It’s made from 100% polyester and promises a tight-fitting soft, crisp sheet. It looks modern and also doesn’t wrinkle, with the main difference being that it's slightly more expensive than SHEEX. Wicked's moisture-wicking and cooling sheets are made from 100% silk-weight polyester that promises to wick away six times as much moisture, dry four times faster, and allow three times more airflow exchange than standard sheets. They're also claimed to remain two to three degrees cooler to the touch and prevent the absorption of heat from light sources. Individual sheets and sets range in price between $64.95 and $209.95. An entire sleep system (mattress, mattress pad, sheets, pillow, pillow protector, and comforter) that uses proprietary Thermocules to help create a unique microclimate under the covers, based on each individual's needs. Alone, their 300 thread-count sheet sets are priced at $130 to $210, depending on the retailer. Microfiber sheets (no thread count) made from 83% polyester and 17% spandex, which is the same combination and percentages found in Sheex’s sheets. Price-wise, we found complete sets available at retailers like Target, Bed Bath and Beyond, Amazon, Walmart, and Kohls for $60 to $110. In a review on Business Insider, we’re told that when personally testing the SHEEX sheets, they noticed that it was able to disperse heat more quickly and evenly, avoiding higher-temperature pockets of air. They were also surprised by how comfortable and smooth they felt, and although they seemed heavier than their other sheets, they reported it delivered a nice “grounding effect” during sleep. Another review by Sleepsherpa gave SHEEX sheets an 8.4 out of 10 rating for fit, durability, softness, breathability, and price, with a few pros and cons to consider. After testing it out themselves, they reported it was an excellent sheet for hot sleepers and for those looking to stay cool and dry throughout the night. However, they did mention to make sure you have a mattress pad/protector that also has cooling properties. Otherwise, your efforts to avoid trap heat may be in vain as the heat could get trapped in the mattress pad itself. One other thing they mentioned was that that the material tends to snag, so if you have rough skin, you may feel the sheets snagging against your skin. On Amazon, SHEEX’s sheet sets came with hundreds of combined customer reviews, who had given them an average rating of about four stars, with compliments commonly citing improved comfort, coolness, and construction quality. The relatively few complaints often referenced hot sleeping and feel preferences. Who Might Benefit from Using SHEEX? When choosing the perfect set of bedding that works well with the color scheme in your bedroom, that can also provide you with a comfortable sleep environment, it often comes down to personal preference, testing it out firsthand, and finding an option that falls within your budget. Although we haven’t personally tested this bedding line out ourselves, after collecting information from the experts and seeing an average 4-star rating on sites like Amazon and Bed Bath and Beyond, it does seem that SHEEX delivers on its advertising claims for most customers. From a price perspective, you’ll certainly pay a premium for SHEEX sheets, although their sets fall mostly in line with competitors like Purple and Boll & Branch. But if budget is your top concern, other companies like Parachute, Wicked, and ProTech might deliver similar cooling results, but at meaningfully lower prices. How to decide? In a review covered by Sleepopolis, they recommend the SHEEX performance collection to sleepers who are in search of a moisture-wicking, durable sheet that is also modern looking. They reported the stitching to be flawless, with high-quality color, as well as very few signs of shrinkage after a standard wash. If you’re not a fan of polyester and prefer cotton, SHEEX does offer a collection of cotton sheets and various other options which you might be interested in instead. And at the end of the day, if you’re not happy with your purchase, you can always return them after 30-day’s and get your money back guarantee. I love the feel and comfort of this product, but...the fit leaves me annoyed! The fabric seems to have stretched during the sewing phase. The fitted sheet doesn't fit the mattress and the flat sheet doesn't lay evenly over the bed, which means my comforter and blanket need to be on the bed at all times. My husband and I constantly fight for covers. A bit more quality control is a necessity! Sheex sheets advertise they can deliver the same day. If not, then the next. I ordered Sheex on 12/19 Saturday. On Monday I was told they would ship on Tuesday, on Tuesday I was told they would ship next week. When I got upset, I said I would like to talk to the accounts that cancel the order, she got smart and said that was here also. The phone got disconnected, no verifying that I actually wanted to cancel and they canceled and said too bad. This small company has no customer service at all. Write a Review for Sheex!